GREENWICH — Their shuttles zipped back and forth, weaving bold color blocks out of bright yarns. 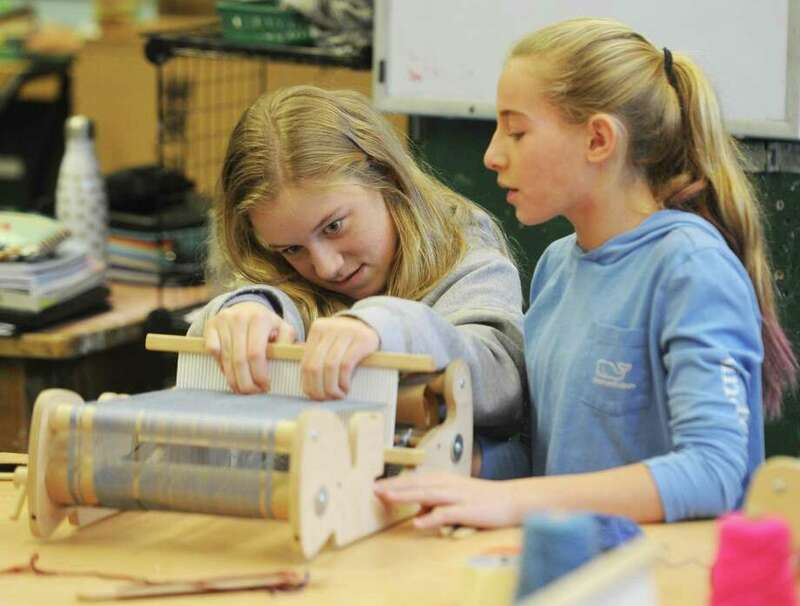 Pairs of Eastern Middle School students leaned over the cricket looms as their handmade textiles emerged. Most of the students in the art room had never woven before. But students picked up the craft quickly under the watchful tutelage of two local artists. Ruben Marroquin and Liz Squillace spent the day at Eastern Middle School late last week to teach students about weaving and the life of professional artists. Their visit was coordinated as part of Eastern Middle School’s Developing Artist Grant. New this year, the $4,500 grant from the Greenwich Alliance for Education provides funding to bring local artists to the school to teach their craft and for students to visit local art museums and artist studios. “The idea behind the whole program is really to give the kids a look at what the life and work of an artist is really like,” said Michael Manning, an art teacher at Eastern Middle School who coordinated the grant. Manning, himself a studio artist, also runs art programs at the Boys and Girls Club of Greenwich and said that he piloted a similar program there. Students will also visit local Master of Fine Arts programs so they can meet artists in their creative spaces. EMS art teacher Ben Quesnal explained that part of the goal of the grant was to create community between schools and local artists. Quesnal, a sculptor and painter, is currently showing his work at the Danger Gallery in Stamford with Marroquin and Squillace. Marroquin, a textile artist, has lived in the United States and Venezuela and studied at the Fashion Institute of Technology in New York City and the National Textile Workshop in Paris. Marroquin creates abstract textile wall-hangings, hand-knit scarves and custom products for interior designers. Squillace, a screen printer, learned weaving from Marroquin in 2009. Her own work includes paintings, printed T-shirts and public street art. Marroquin and Squillace have run many local weaving workshops for children and adults in Connecticut. Last year, they taught students at Old Greenwich School the craft. Eighth-grader Zoë Seguin said she was excited to learn the process behind a familiar art form. Sammy Ennis, also in eighth grade, said she appreciated the chance to learn from professional artists. Irene Parisi, assistant superintendent for curriculum, instruction and professional learning, and Deputy Superintendent Ann Carabillo visited EMS to check out the program on Thursday morning. Fostering a passion for art in Greenwich youth was one of the reasons why the Greenwich Alliance for Education decided to fund the grant, said Julie Faryiniarz, executive director for the Alliance.